Starting from today, 11/1/2011, a date very dear to the numerologists who are always been looking for special recurrences,a new treasure, or rather a “mine of treasures”, can be found online. It is the preliminary catalogue of the data by the European satellite Planck, a catalogue of data for expert astrophysicists, but that represents a considerable leap forward in learning more about our Universe. However, this is only the beginning since the satellite has only carried out half of its tasks, which will end, if funds will be available, in about two years. Then, approximately ten years will be needed to clean and deeply analyse the enormous amount of data that Planck has been transmitting. Its main purpose is to understand the origin of the Universe, analysing very accurately, the cosmic microwave background radiation, also known as relic radiation. It is what remains of the first electromagnetic signals left over by the Big Bang, about 300,000 years after its beginning. Before that, there was no matter that could produce radiations. Since that moment, the Universe has been expanding up to 13 billion light years, which is the part we can see, and the radiation as been expanding as well. Then it cooled down to almost absolute zero, only 2.73 degrees above. It is everywhere, even in the space between the eyes of the reader and the screen. We cannot see it because it is made of microwaves. Actually, it is an extremely slight echo of that very far away phenomenon. The preliminary catalogue contains thousands of microwave radiation sources, both from our Milky Way, and outside of it. For the first time it shows some important phenomena under a new light, such as nucleuses of new generating stars when they are still “cold”, right before the starting of the nuclear reactions that maybe will continue for thousands of years, as our Sun. Moreover, clusters of galaxies, at least 189, 20 of which unknown until now, clouds of nanopowders every particle of which rotates at an incredible speed, and especially the most intriguing discovery, the fact that our Galaxy is surrounded, above and below the galactic plane, by two clouds of dark gas, hydrogen that does not produce any other kind of radiation, and that could not be seen before. It is like dust falling on a raft, the Milky Way, for the generation of new stars, both from “above” and “below”. However, these results are only data of “secondary importance”, as the recovery material of an archaeological excavation. In fact, the cosmic microwave background radiation is hidden under a huge quantity of much stronger signals, as those of all the stars and nebula of the Milky Way, the ones of other galaxies, clusters of galaxies, and very far and powerful sources of all kinds. It is an incredible “cleaning” work, like trying to find a very soft and slight whisper in a square crowded with people talking, discussing, shouting, playing the trumpet, and so on. Therefore, this preliminary catalogue, representing only the first “cleaning”, has already shown to contain incredibly precious astrophysical information. «The astrophysics are clearly very interested in this data», says Luigi Danese, from the SISSA, the Higher International School of Advanced Studies of Trieste, one of the “fathers” of the Italian participation in Planck, which started 18 years ago. He is a cosmologist, that is, “reconstructs universes”, and therefore, he is interested in arriving, as soon as possible, to the last “layer” of the excavation when finally the cosmic microwave background radiation map “cleaned” from all the signals from stars, galaxies, and other celestial bodies will be obtained with an accuracy much higher than the one of the previous satellites, such as the American WMAP. «We help one another – continues Danese – because the results we will obtain, at least we hope, will be fundamental to better understand how galaxies and stars were generated». It is a sort of competition, but based on collaboration, as we are in the age of web 2.0. The scientific results were illustrated during a packed press conference at the Agenzia Spaziale Italiana (ASI) (Italian Space Agency) by the responsible for one of the two instruments on board the Planck satellite, Reno Mandolesi of the Istituto di Astrofisica e Fisica cosmica (Astrophysics and Cosmic Physics Institute) of Bologna. However, to underline the importance of the event, the press conference was held at the same time, or almost, with other similar ones in Paris, Copenhagen, and Seattle. Planck is really a pride of European technology, science, and industry, that, as Fabio Favata of ESA, European Space Agency, recalled, in the last 20 years has brought itself to the level of world leaders in various fields of scientific research from space; «100 Research Institutes and Universities in 11 European Countries evidence the complexity of this extraordinary machine and, at the same time, what Europe can do when three components, science, industry, and space agencies, work together and in unison». For the Italian part, apart from the financier, the Italian Space Agency that dedicates about one-third of its annual budget, 200 million euro, to the science part, which is very satisfied for the results obtained in the international field thanks to this mission, as reported by its President, Enrico Saggese, a hundred researchers and technologists of a dozen of Research organisations and Universities, and Thales Alenia Space of Turin and Milan also worked on the project taking care of the payload and the instrument of Italian responsibility, Pasquali Microwave System, an SME, curated the delicate waves guides of the instrument and Galileo guaranteed the extreme cooling of the second instrument on board Planck. The satellite has been flying for more than one and a half years, in one of the coldest and most stable parts of the Solar System, L1, a so-called Lagrangian point, since the great French mathematician and astronomer Lagrange discovered them with mathematics and not a telescope. There, at 270 degrees below zero, the stability is at maximum because the attraction forces of the Sun, Earth, and Moon are equivalent, as if three strong men pulled three different ropes, but no one could prevail. As if it were a video camera that rotates continuously “shooting” the film of the Universe, covering the entire solid sphere that it sees from its point of view, now at its third rotation, to be completed, of the four foreseen. The next results? 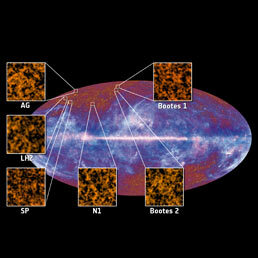 «To have the cosmic microwave background map – Danese says – and be able to study it together with its possible polarization. This could make us understand what happened “before” the 300,000 years, since we could find signs of gravitational waves, caused by matter that existed before, even if it did not emit radiation ». Lastly, why spend all this money, 500 million euro, 29 of which provided by Italy, to understand how did the Universe “begin”, if this ever happened? “Apart from natural curiosity that has always led man to want to know his origin, we must think that only in the Universe we can find energy and phenomena that allow us to go ahead in the study of basic physics. We are talking about phenomena that we could never study in a laboratory, the Universe is the real and extreme laboratory” from which Danese seems to conclude, from which derives the technology useful in everyday life. In effect, who discovered the electron more than a hundred years ago was certainly accused of “uselessness”, now maybe from the production and transmission of electric current to computers, mobile phones, and all the electronic equipment that discovery is quite useful.